Check out the character poster for Winter Soldier in high resolution in the gallery now. 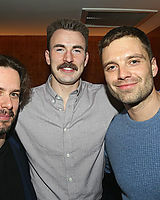 On March 26th Sebastian attended the Broadway Opening Night for ‘Lobby Hero’ to support his Avengers co-star Chris Evans who stars in the play. You can find photos in our gallery now from the event. SlashFilm.com — And now, here is our final interview from the set of Avengers: Infinity War. 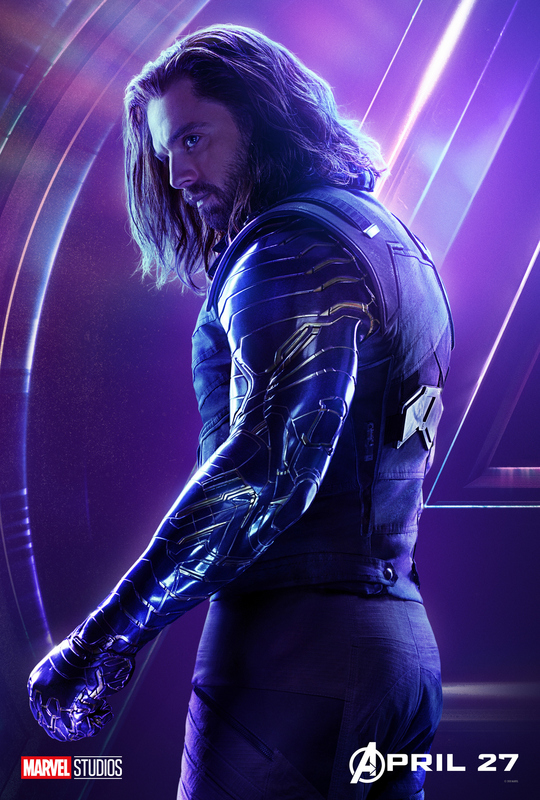 Today, we bring you our roundtable conversation with Sebastian Stan (Bucky Barnes, AKA Winter Solider) and Anthony Mackie (Sam Wilson, AKA Falcon). In typical Marvel fashion, the actors were told to reveal nothing to us. This is sometimes frustrating for a journalist on set just trying to figure out what exactly he is watching, but in this case, it’s extremely entertaining. You may not learn much from this interview with Mackie and Stan, but I promise that you will enjoy their antics. Anthony Mackie: Hello, everyone. Welcome to Avengers 3. My name is Anthony Mackie. 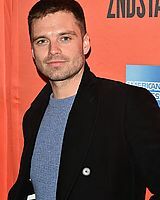 This is Sebastian Stan. If you have any questions, direct towards us. We will answer them in a timely fashion. Do not ask anything about the movie because we will not answer. This will go extremely well and you will enjoy. What’d you think about Wonder Woman? 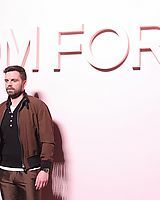 Sebastian Stan: I haven’t seen it. Mackie: Loved it. It’s great. Ladies, great job all of you. Great job. I’m very proud of you. We noticed Bucky isn’t frozen. You’re walking around here. Stan: This is where he’s not frozen. That’s good for someone. What’s he doing in Wakanda? Stan: The same thing he was doing in Wakanda the last time you saw him in Wakanda. 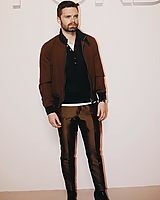 Mackie: Hanging out. Eating Wakandanese food. Stan: Dreaming in his little spacecraft. Well, that’s the last time you saw him, right? So, he’s here taking in the scenery, I guess. And the scenery ain’t great? 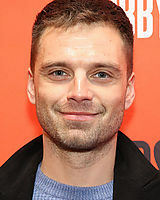 Will he be in Black Panther? Because that’ll have come out by the time we run this. Mackie: We’ve already told you, we can’t say. I congratulated your people and everything. You’re messing it up. In between Civil War and Infinity War, has Falcon been with Cap and Widow? Mackie: No. We all kind of went on our separate ways after Civil War. We all kind of went on our separate ways and we were in hiding because of everything that happened in Civil War. So now, we get the call to rally, and here we are: Avengers 3. What are you rallying for? Mackie: Freedom. Truth. Social liberties and peace with all men and women. So the villain in this one is Thanos. What can you tell us about Thanos? What does Winter Solider think about him? What does Falcon think about him? Stan: Winter Soldier is just enjoying his new arm. And that’s really where he’s at. Mackie: It’s a nice arm. All lubed up and ready to go. Stan: And he’s learning new information as he goes along. Your character is a very realistic kind of guy, so what does he think when he hears about this all-powerful being who’s going to kill everyone? Stan: You think of W. He was so great in that movie. Stan: He’s a great actor. Winter Soldier’s been through a lot of emotional trauma. Has he had some therapy since Civil War? Stan: Absolutely. Yes. Definitely. Much more. So he’s more peppy and perky? Stan: I’ll tell you, in the ten pages that I was allowed to read, I didn’t see that. Stan: For the other, I don’t know, 90 to 100 pages that are in this film, that I did not read, I have no idea. How do your characters feel getting back together again, since we know you were best buds? Collider.com — Last summer, I was invited alongside a group of journalists to visit the Atlanta, Georgia set of Avengers: Infinity War. You can read a more in-depth account about my experience on the set here, but suffice it to say that it was indeed epic. The amount of star-power in this movie is mind-boggling, and over the next several weeks I’ll be publishing interviews with the cast and creatives behind it all. They couldn’t reveal much in the way of specifics, of course, but it was really fun to just see their banter and interactions — which is really the crux of what the Avengers movies are all about. 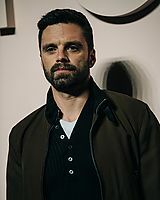 QUESTION: So what is Bucky doing in Wakanda? STAN: Dreaming in his little space craft. Well, that’s the last time you saw him, right? So, he’s here taking in the scenery, I guess. And the scenery ain’t great? What can you tell us about Thanos? 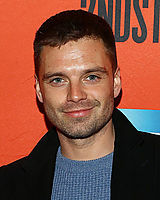 What does Winter Solider think about him? What does Falcon think about him? For Anthony, your character is a very realistic kind of guy, so what does he think when he hears about this all-powerful being whose going to kill everyone? MACKIE: One thing about Falcon I’ve always loved since the beginning of discovering this character is his military background, his belief that his job in life is to fight for his fellow man. So when he hears about Thanos and his overall idea of world destruction, he’s very disheartened and shaken by it. He’s eager to get into the fight against this super evil, this diabolical demon known. 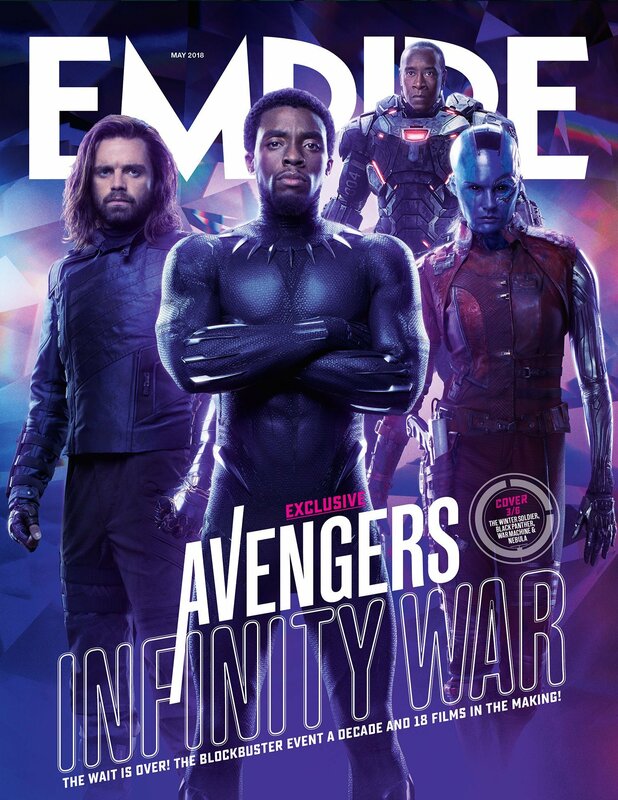 Entertainment Weekly is known for it’s special collector edition covers and Avengers: Infinity War is the latest to get the honor with a whopping 15 exclusive covers featuring a variety of characters from the film including our obvious favorite, Bucky Barnes. 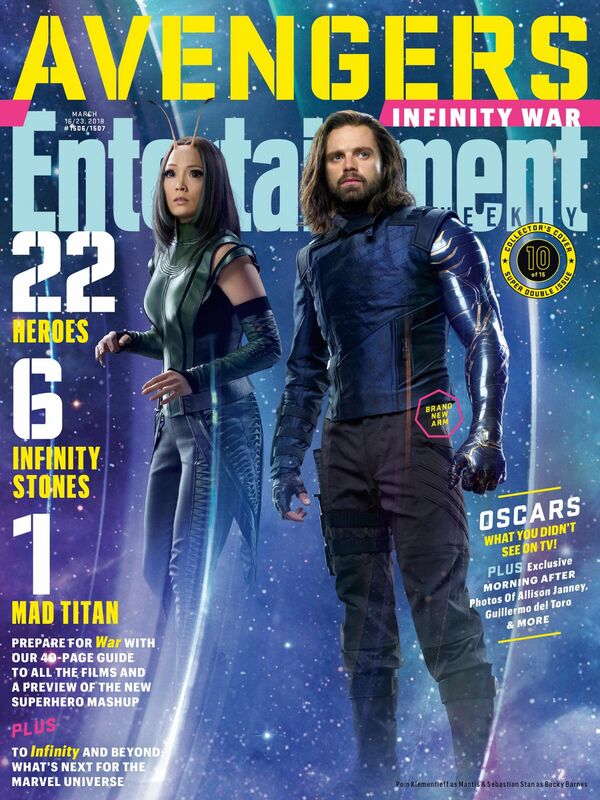 Sebastian is pictured with actress Pom Klementieff as Mantis from the film Guardians of the Galaxy VOL 2 in one of the 15 covers for the March 16th issue. You can view the cover in high quality in our gallery now.